Sorong city in West Papua province is the main gate to Raja Ampat. Most tourists who want to enjoy snorkeling, scuba diving, birding and sighseeing in Raja Ampat regency fly to Domine Eduard Osok airport of Sorong and then continue their trip by passenger ferry to Waisai town. In general, tourists spend one or two days waiting for their return flights or waiting for their liveaboard dive boats in Sorong city. During this time, they look for activities that they can do. 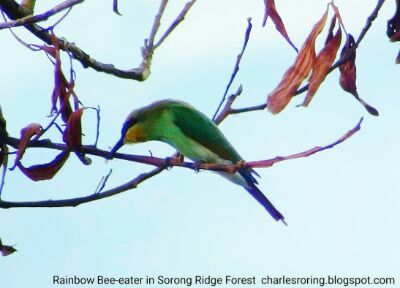 For this purpose, I offer Hiking Tour in Sorong Ridge Forest. 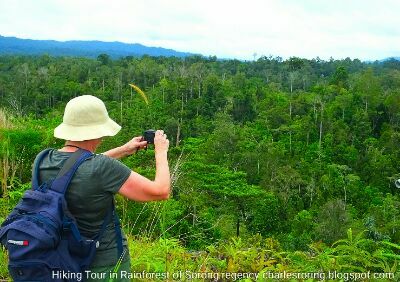 During this tour, participants will be able to see the landscape view of Tropical Rainforest of Sorong city. Please, wear hiking boots or sport shoes. I recommend that participants bring a digital camera. Participants of the tour will also see mountains that are covered by rainforest. The rainforest itself is the natural habitat of birds, butterflies, beetles, and a lot of unique tropical plants. 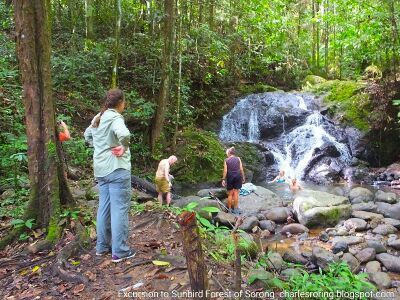 After hiking along the ridge, visitors can enjoy swimming in the natural pool at the foot of a small waterfall. Don't forget to bring bathing suit. While participants swim in the river, I and one or two local guides will prepare hot water for making tea and coffee. When I guided tourists in the forest I had the chance to see the types of binoculars which they were carrying. There were the ones that were manufactured by Leica, Swarovski, Bushnell, Canon, Eagle Optics, Nikon, and Pentax. But there was a pair of 10×42 binoculars whose brand was Zen-Ray. It belonged to Anita, a tourist who was from the United States of America. I tried it once and was amazed by the excellent quality of the image which the binoculars produced. To take pictures of the surrounding sceneries of the forest, birds, butterflies or wild flowers visitors need a camera with super zoom lens such as Nikon Coolpix P900 or Canon SX60HS. I personally use Fujifilm Finepix HS50EXR. A good tripod will enhance the quality of the bird picture that tourists take during the hiking trip in the forest.